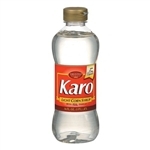 Wholesale Karo Red Light Corn Syrup 473ml case of 12 Plastic Bottles. Due to weight restrictions, can only fit 2 cases only per shipping carton. Re-order as many times as you like.